There was a time when I used to go on fishing trips with some fishing kakis on my staff- for males only, of course. After all, have you seen any fishing boats equipped with toilets? 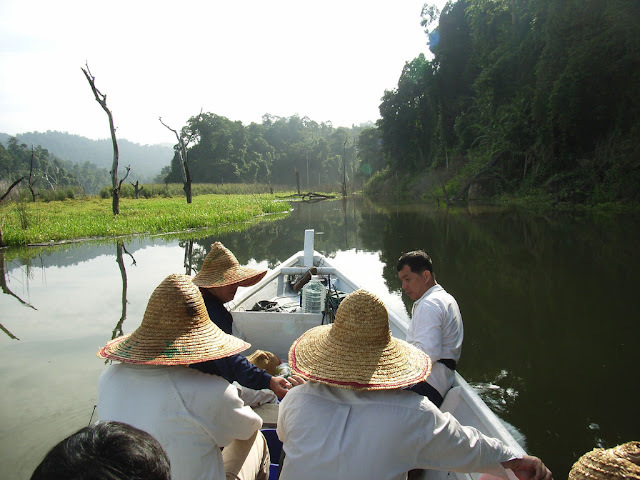 One of our favourite destinations was the Banting Lake located north of Ipoh. We went with my brother and some die-hard fishing kakis from Ipoh. We looked like a bunch of Vietcongs. The lake is larger than the land size of Singapore. Handphones will not work. Wives and bosses cannot reach us (sometimes, these are synonymous). We were completely shut off from the world: just us and nature. These are perfect conditions for fishing - total focus on the line in the water and what is being tempted by the bait. We saw low-flying eagles and judging from some tracks, we knew elephants were around. At nightfall, we will set up camp. We bathed at the cold waterfall, squealing like schoolboys under the moonlight. We set up the fire. Before we slept, we lit some fire-crackers as the smoke and smell kept the animals away. We were on a fishing trip, not a hunting one. Early at dawn, we saw the splendour of God's creation. At the mouth of the incoming river, we used artificial lures to catch another type of fish. They glimmered as they streaked across through the waters under the morning sun. What a view. What a life. Staff bonding time is made of this sort of stuff indeed. 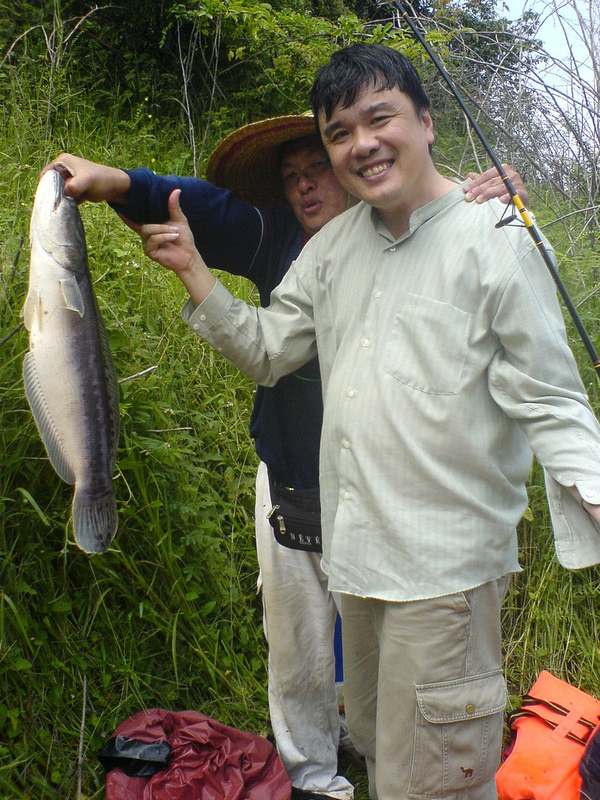 You have to find the fishing spots to catch Tomans (Snakehead fish). When we saw air bubbling up to the surface, we would cast our bait there. Here is where all ideals of staff teamwork bubbled away as we competed to bait the large ones in. More often than not, the fish will bite. They are normally 3 kilos or more. 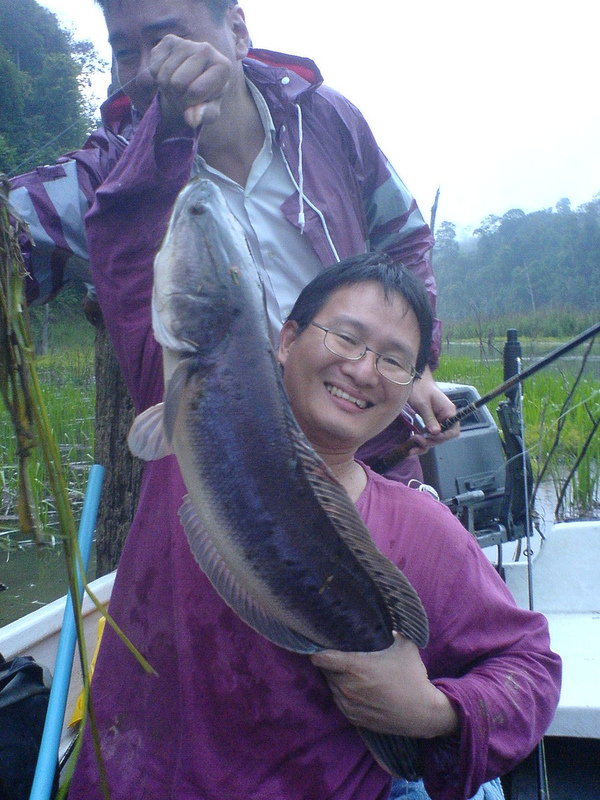 But the fish which is harder to get to is another type of Snakehead species: Haruans. They are normally found in the undergrowth of lallangs by the shallow banks of the lake. You have to wait patiently and very slowly reel in the baited frog, hoping that the haruan will bite. There was a particular kaki who looked like he had been fishing all his life. Tanned, lean and with a Clint Eastwood look, he squatted patiently with a cigarette in his mouth and waited for them. While the rest of us were satisfied with the easy-to-catch tomans, he went for the prized haruans. And he caught a few. Not only is haruan harder to catch, it is also prized for its meat. Apparently, it is tastier than tomans. So, I too, joined him from time to time. Did I manage to reel one in? In my dreams. Somehow, catching fish is not my "gift." (That is a more positive way of saying that I am bad at it). I tried to do everything this guy was doing, including squatting and putting on the snarly Clinty look, but short of sticking a cigarette in my mouth. The haruans just wouldn't bite. My frogs eventually died from too much water surfing. Those memories stayed with me. If only I could get just one haruan. Just one. This also explains my fascination with it. In Malaysia, we call haruan "Sang Yue" and tomans, well, tomans. Malaysians know the difference. It seems like in Singapore, "sang yue' means either. The ubiquitous fish soup in our hawker centres here is mostly made from tomans. It is farmed these days and this explains their easy availability. There are different snakehead species. In fact, haruan's binomial name is channa striatus, and toman, channa micropelte. Tomans make for good eating of course but haruan is quite something else. The meat is sweet and it is expensive during Chinese New Year because it is used for Yue Sang. If you want to find out more about it's pharmacological and nutritional info, go here. Toman is toman. Haruan is haruan. Remember this and don't let any fishmonger fool you and pass off toman as the other. I came across some "real Sang Yue" aka haruan at the Ghim Moh wet market recently. This particular stall sells only this. And she opens it only on Saturday and Sundays. The fish is nicely filleted and the bones set aside for separate purchases for stock or soup. She has been selling this for over thirty years at the same stall. Her supply comes from Indonesia and occasionally, China. This Auntie at Ghim Moh Wet Market stall has been selling this, and only this for 30 over years! I could not resist buying them. If you can't reel them in, pay for them. It is time for some great fish soup. Haruan is also good for a simple stir-fry with ginger, scallions and some Chinese wine. Ok, the recipe for that will be up soon. Boil 3 litres of water. Add the haruan bones (as in pic above - these cost me $3). Add 5 pieces of sugar cane, as in pic. Cut them in sections and give it a whack with the flat side of your chopper. Alternatively, you can use rock sugar. Add a lump of ginger. Simmer for about an hour till the soup is whitish and cloudy from the gelatin in the bones. Finish off with soy sauce and sesame oil to taste. You can add some chicken stock if you like. Blanch the slices of haruan meat - 30 secs will do. Scoop the soup into the bowl, add a few slices of the blanched meat and serve garnished with coriander leaves (cilantro) or diced spring onions (scallions). Enjoy as is or with a bowl of rice. The soup is heavenly, just like my fishing experience at the lake. I still dream of catching a haruan one day. Till then, I will be making my occasional Saturday morning visits to the wet market and bring some home. Hihi where can i find this wet market and stall pls? looks good...going to try making this soup too. Have you tried to heat a little oil with ginger slices and pan fry the fish bones first. Then add the desired amt of water to boil soup. This way will help to alleviate some of the fishiness. Although i prefer your method cos less work of pan frying. What do you think? Will it make a difference to the strong "fishy" smell? The last time I made it, I did not detect any fishy or muddy taste, it is a clean eating fish, unlike tomans which are farmed, and thus have the muddy taste. thanks thanks :) i take it that there is only one fish stall aunty right? am so keen on trying it out...looks fantastic. btw will she get offended if i ask her if the fish comes from china? another tip....can try adding soya beans to the soup to enhance the flavour as well. don't add too much as it might come out as soya bean soup tho. Hi Anon - Sorry for late reply. Ask away. I don't think she will be offended! This kind of blog is a very wonderful that talks put all of the necessary details in preparing that dish. Although you need to catch it before you cook it as long as you have the right material like artificial lure, live bait and some dead bait then it would be easy for you to have that kind of fish.